A new stage select shows which stages have been cleared. 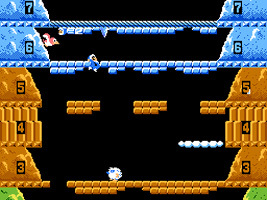 Stages cleared by grabbing the Condor are displayed with Popo, while stages cleared by reaching the bonus area only are displayed with a Topi. A new Bee enemy appears that flies horizontally across the screen. This has been replaced with a Nitpicker in the Disk System version. Windy stages constantly push Popo or Nana. When you break some platforms you will find a Bonus Multiplier item. If you clear the stage with it, then your score will be doubled.